In Riding Giants, Laird Hamilton compared surfing to dragon slaying. I humbly have to agree. There are big majestical dragons with gem encrusted bellies and there are small quick dragons that can knock you off your feet. Each time you pull your board off your surf rack, you are embarking on an adventure of epic proportions. 1. Each Wave has its Own Story. Every surfer has their first wave story and the wave that sold them on the sport. Some surfers have waves where they said goodbye to a lost friend, others have marriage proposal waves. 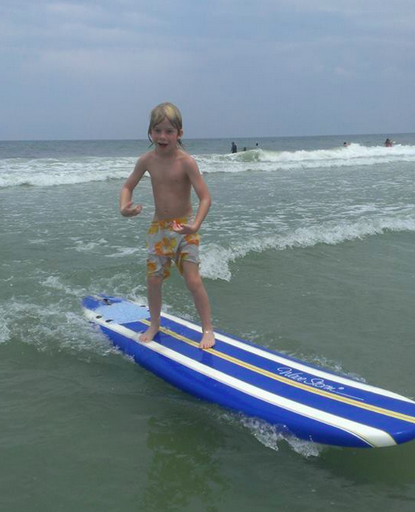 I have the dinky little wave in North Carolina that broke my back in six places and the waves in Hawaii and Florida where I taught my children how to surf. The best way to make your own wave stories is to go surfing. 2. Riding Down the Face of the Wave is a Spiritual Experience. Many surfers experience a spiritual epiphany at some point in their surfing career. For each person, it truly is different. Some say it is that rush of adrenaline, others feel like they are communing with the Almighty, and still others claim its spirituality comes from the stimulation of all five senses. Honestly, it really doesn’t matter. What is important is at the end of the session you feel in some way even if for a brief moment, you reached for God (or your creator) and He reached back. Surfing releases endorphins, which react with receptors in your brain that reduce your perception of pain. Endorphins also give a person positive feelings that counteract stress. Surfing is both an individual sport and a group sport. Surfing is an individual sport because each person rides the waves alone and a group sport because the line up offers numerous people to interact with. Spending time alone and getting advice are all options when one is looking to decompress. These are only 3 reasons to surf, there are many more reasons to surf. Tell me, why do you surf?